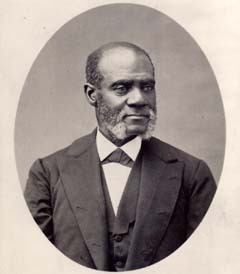 click image for close-up When he first emerged onto the antislavery scene, Henry Highland Garnet was strongly opposed to sending blacks to Africa as a solution to the slavery problem. His views changed over the years, and by 1849 he believed that emigration to Africa could coexist with the fight against slavery at home. Around the time this photo was taken -- around 1881 -- Garnet even planned to move to Liberia, the country in Africa colonized by American blacks. He moved there in 1881, after being appointed by the government to a post in the country. He died two months after his arrival.